I purchased these glow sticks at the dollar store. Bracelets come in a pack of five. You can also get some at Michaels Craft Store in a pack of 15 for a buck! 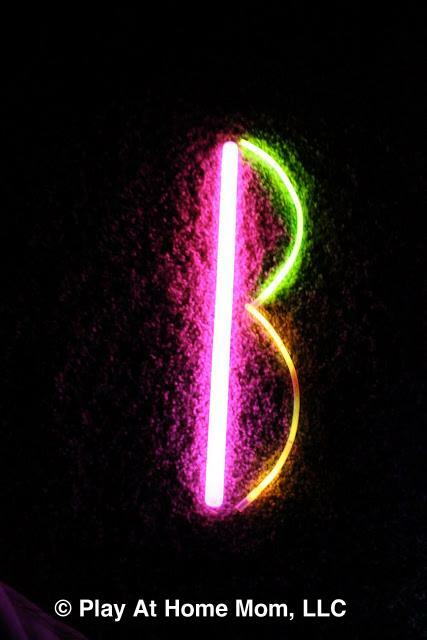 If you store the glow sticks in the freezer after using them, they will last several nights. Fill water up at various levels and place glow bracelet inside. THE AURA IS JUST A CAMERA EFFECT!!!!!! Glowing balloons. Place glow stick inside of balloon. For the post on this please click below. Awesome! 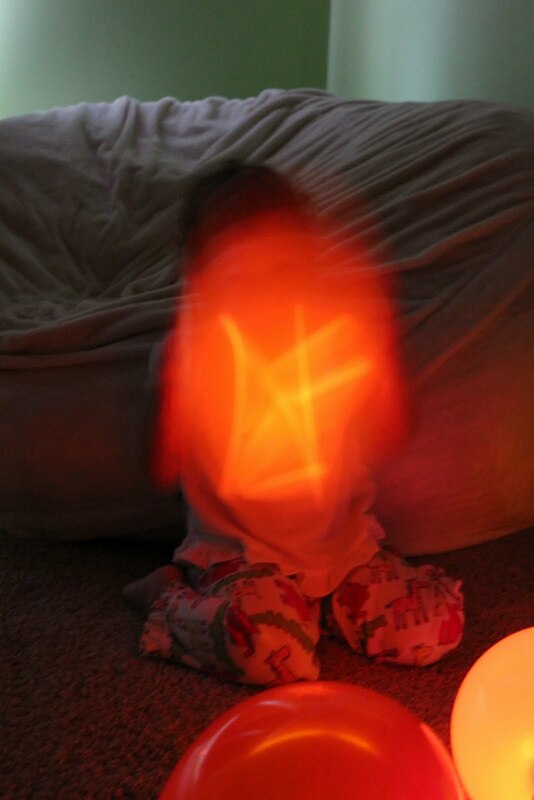 My daughter has a box of glowsticks, and now I know what to do with them! This is so cool, the children will enjoy this. Thanks :-) for sharing. Yes, just a camera effect. I turned on the flash for that one and that is how it came out. I just found fifteen little "glow bracelets" for a dollar at Michael's in their dollar section. We put them in the bath, made a little fort/Cave and played in there for a bit... now they are scattered on the living room floor dying a slow death. I love toys like that that cost so little that I don't have to worry about what happens when she is done with them! Thanks for the suggestion! 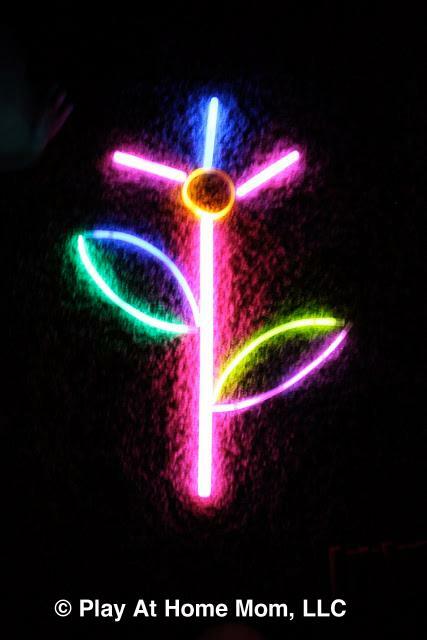 Totally know what we're doing with our leftover glowsticks now! Amazing ideas, no clue why I didn't think of this stuff sooner! Thanks a ton! I'm loving all this, and the photography is beautiful too. What settings are you using with all of the glow photography? Thanks! That neat, all things you can get a the $ store. Just like some you would find at the children's museum. You have great ideas. Thanks. I just want to say we did have an episode that a glow stick was snapped open and the liquid was flung out into the children's faces. We have no clue how this happened. And we will use them, no one was hurt but we are careful to only let them use them with a parent present. Loved it. I picked this up via 'Thomas Marshall Does It All' blog. My kids just had their glow stick bath tonight and it was awesome! LOVE IT! definitely trying this with my little guy! i suggest you never beg your child to do anything, it takes away from your authority. You are the parent, the boss, your kids will respond to that. 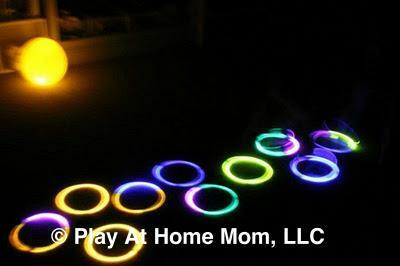 I love these ideas, I can't wait to buy some glowsticks and try some of these things with my children! I just wanted to let you know that I shared this awesome idea on our Fish Sticks fan page (http://www.facebook.com/fishsticksandkidsense). I just wanted to let you know, and thanks for all your awesome posts!! This is so cool! I seriously need to make a buncee of this and share it to my friends! Awesome! Do you need to use black light for this? If yes, what type? In picture 7 of 17 with the child in the bath tub. First I should say I love the idea of the glow sticks in the bath and balloons. Second I hope you don't mind me making an observation but the child looks like their fingers on the right hand are hyper extended (bend back farther than they should) this is a sign of hyper-mobility which is caused by EDS (Elhers Danlos Syndrome). I could be completely wrong but I just wanted to let you know encase your Dr. couldn't figure out why the child's joints are sometime unstable. I hope I am wrong but just my two cents. 10%-15% of normal children have hypermobile joints and there are MANY reasons for joint hypermobility. Scaring a mom with EDS is the proverbial looking for zebras when you hear hoofbeats. Thank you, Harriet. I was at a loss for words. Awesome Pictures. Looks like a lot of fun. Thanks for sharing. Hope to see you at True Aim. Fabulous!!!!!! !And I dont even have children! What is the green thing at the end of the bath (looks like a turtle?) and how did the stars get on the tub wall there>? (pic 3 of glow bath). It a night light turtle that projects stars on the ceiling. It looks like it was set up at the end of the tub on an angle. Love your site and all the glow ideas. Just thought I would let you know if you didn't already that the 3rd picture of the glow sticks in the glasses is circling Pinterest like wildfire! Too bad all the captions look like this: "Glow stick xylophone. Put the glow sticks in cups of water and an aura comes off in the dark, when you tap them. Gotta try this!" Just an FYI that someone is using this photo on Facebook without due credit to your blog. )o: They are basically trying to run a 'Pinterest' style page from FB but no links back to the original blog. I love this blog! I tried the xylophone tonight and nothing happened. Do you have any suggestions? Thanks! 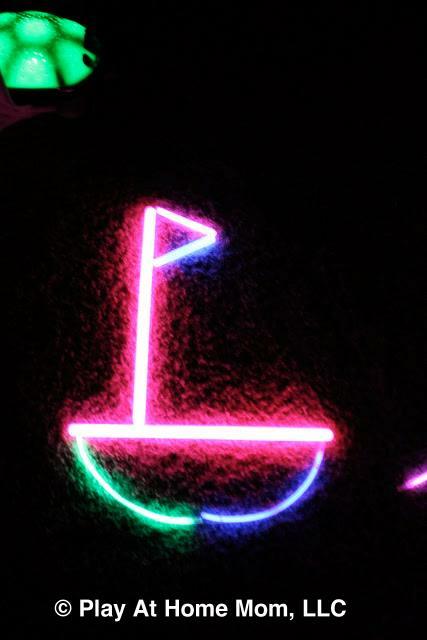 How did you make the aura on the glow sticks with water work? We tried (with the thick glow sticks) but it didn't work. Will have to get some of the thin glow sticks you used and try that! I love the photo at the top of the page with the child's hands in the small balls, and a glow coming from underneath! How did you do that? How! You got me! I didn't read the "The aura is just an effect from the camera" and I tried it because I found it unbelievable... Well of course it didn't work. good that nobody saw me doing it.... Fool! We tried this tonight...for those asking about how she made the effect of the aura..you can't see it with the naked eye. It was an effect that was captured on camera. She clearly explains this in the post BUT the popular pin image that is going around gives a false description of the activity and of course most people are hoping to see the aura when they tap the glass..which doesn't happen. Cool xylophone though!